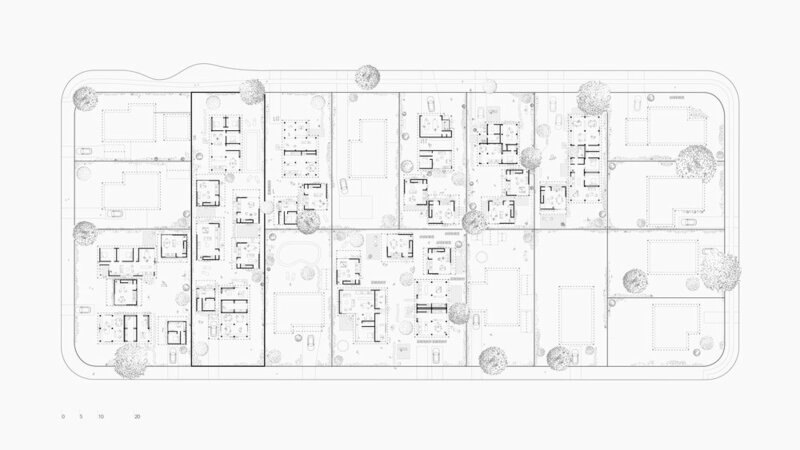 Dappled Dwellings is a medium density housing proposal located in Brisbane. The project was developed in response to the Queensland Government’s Density and Diversity Done Well competition. It was announced a winner of this competition in 2017. This proposal seeks to densify within and around a suburban neighbourhood. Rather than starting anew, it adds density below and behind homes that already exist. This creates a subtle, respectful and stealthy transition to higher density within these suburbs. Dappled Dwellings responds to two elements of Brisbane's vernacular architecture. 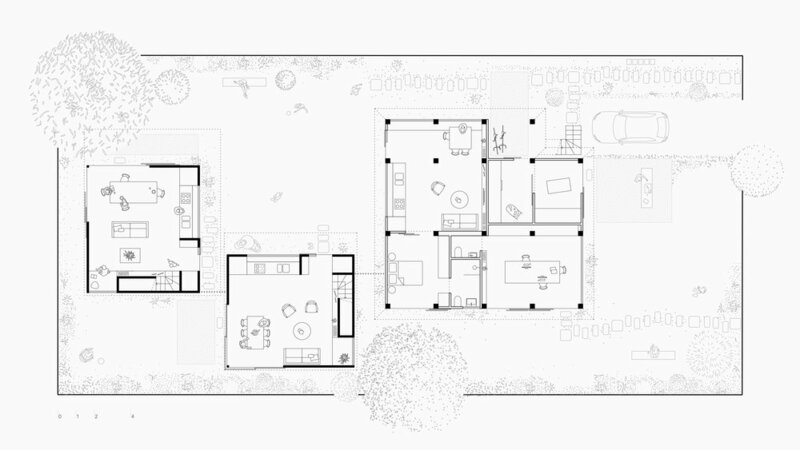 Firstly, it appropriates the flexible and resilient floor plans provided by post-war timber cottages. These homes contain clusters of rooms which, unpicked and unpacked, can host multiple functions and needs. Secondly, the scheme borrows from the tradition of the elevated Queenslander. 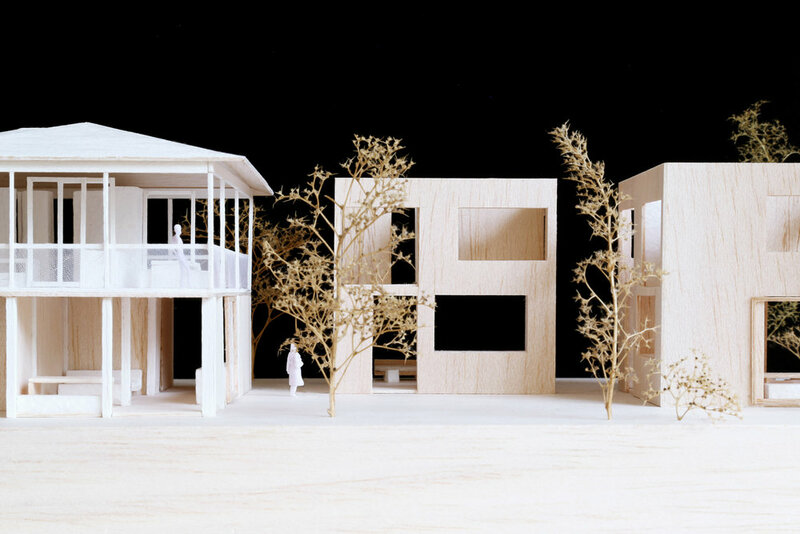 The proposal raises a typical weatherboard cottage on stilts, infilling the space below with new uses. This also allows existing neighbourhood streetscapes to be retained at a modest scale. In tandem to this strategy, the rear yard is populated with two new 'micro-dwellings' - small footprint, self-contained homes that gather around a garden space. The intimate scale of courtyard housing encourages the benefits of density – neighbourliness, awareness and hospitality – to occur naturally. The architecture is tailored towards Brisbane’s climate and embraces casual living. The existing timber houses are refreshed, while the micro dwellings are shrouded in a white mesh veil that will become covered with plants. This provides each home with dappled light, cooling and a softened green outlook. Dappled Dwellings responds to the increasing need for accessible housing in Australia. The micro dwellings are small in footprint and simple to build, making them compact and affordable. Each home relies on pooled resources, reducing individual price points and making home ownership an attainable goal. Consequently, the strategy acknowledges the shift in our nation’s housing needs. It creates diverse housing choices for people beyond the nuclear family, including singles, couples and the elderly. As such, the scheme furthers ideals of ageing in place and encourages a genuine demographic mix. The small-scale, suburban infill strategy proposed by Dappled Dwellings forms a slow and appropriate transition to density. These small changes are designed to filter through a suburban block, allowing a neighbourhood to transform incrementally, over time. In contrast to models of unsympathetic development, Dappled Dwellings retains neighbourhood streetscapes and morphs backyards into villages. It allows existing homes to remain in place, with a gradual shift towards density that fosters, rather than compromises, community. It is an architecture that facilitates the best qualities of suburban life – the peace of being surrounded by garden, the comfort of care and companionship, and the familiarity of knowing your neighbours.